You’ve created the landscape of your dreams, and now, you can’t wait to share it with your family and friends. But at the same time, that doesn’t necessarily mean that you want to share your backyard with the rest of the world, as well! Searching for some privacy, you want to shield your yard in an aesthetic balance that still shows off your backyard’s beauty. With our strategic privacy screening backyard designs, Topaz has you covered. First, our team evaluates your property, and then offers several suggestions as to how you can best shield your yard from unwanted viewers and disturbances. 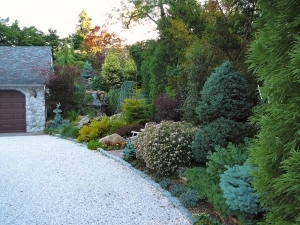 From fencing and stone walls, to plantings, our years of experience allow us to provide the solution that best matches your personal taste and style. To put it simply, we think outside of the box—without making you feel like you’re living in one. Offering a variety of options and avenues, Topaz works diligently to ensure that your privacy screen will be durable, effective and visually appealing. Take a look at our photo gallery to see some of the efficient and beautiful privacy screens that our team has installed for other homeowners. A gorgeous landscape is not enough if you cannot fully enjoy it. To feel comfortable in your own personal sanctuary with an effective backyard design, get in touch with our landscape designers today.